One Sunday a month, Tuxedo Boy goes to Pokemon Club–a gathering of Pokemon-minded second graders at the home of a true saint, Adam’s Mom. As many as ten kids show up for this two hour event, which includes card swapping, Game Boy playing, movie viewing, and bonding. I bow down in awe to Adam’s Mom, a woman of iron will and immense hospitality. You are a goddess, Adam’s Mom. We’ve done homemade Oreos, brownies, pink lemonade cupcakes, and now, this spectacular and delicious Giant Sugar Cookie recipe from last April’s Everyday Food. I know, I know. You don’t keep old issues of magazines around to read in the bathtub, because you’re not pitiful like me. 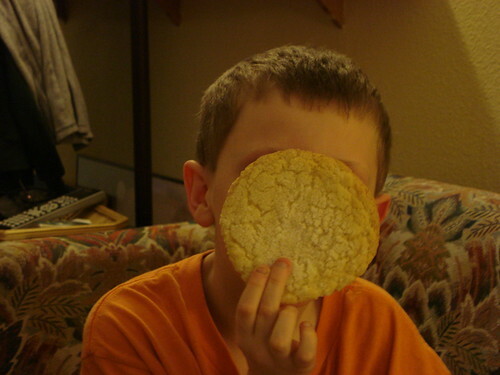 But–and this ought to sting–I’ve got these incredibly delicious cookies to show for my slovenly habits, and you don’t. You’re not eating tender, just slightly chewy, vanilla and buttery cookies right now, are you? You’re not enjoying the sweet crunchy sugary crust, the toothsomely melting crumbs, the lingering aroma of vanilla on your palate . . . not to mention the two-fisted size of the thing–the over-the-top giganticity which makes it more delicious, because there’s just a little too much of it to handle. But you easily could be. In a mixer, cream the butter and sugar until light and fluffy. Add the egg and vanilla and beat thoroughly. Add half the flour mixture and the sour cream, and stir on low. Add the remaining flour and stir just until combined. Using a regular ice cream scoop, drop mounds of dough 3-4 inches apart on a Silpatted or parchmented cookie sheet. Flatten slightly with your hand and sprinkle with sugar. Bake until edges are browned and tops are glazed and firmish, about 20 minutes. Cool cookies on a rack. Ok — I’ve never been memorialized on the internet, so I’m blushing — and when she says “the least she can do” she’s minimalizing it just a tad. Those treats have been such a stress reducer. She spoiled me — I didn’t even ask, yummy treats just appeared at our door each Sunday along w/ Tuxedo Boy. I’m going to have to find out the origin of that nick name! So — while I appreciate the compliment, I must extend the same — it was fun, but we couldn’t have done it without such tasty support. Many thanks!!! Tuxedo Boy . . . well, partly an homage to Sailor Moon’s Tuxedo Mask (we are all big Sailor Moon fans around here), but more because when he was about 5, he saw an ad for an old James Bond movie, and was transfixed: “What’s he wearing?” Joan told him, “That’s a tuxedo.” “I want one of those!” he said. And he was serious! Finally Joan’s sister who lives in Los Angeles picked one up at a studio wardrobe sale, and he wears it on every possible occasion. Joan Opyr: Not Just My Ladyfriend!